Kleiner Perkins Partner Mary Meeker published her annual “Internet Trends Year-End Report” tonight, providing an update on the glimpse she gave us into mobile trends back in November. As per usual, the Kleiner partner’s biggest conclusions are somewhat familiar: Internet growth remains robust, and penetration in the U.S. leads all other countries. While iPods changed the industry and iPhones “ramped even faster,” iPads leave both of those in the dust, as Meeker’s graphs shows the comparison between the three Apple devices, and yet Android has managed to grow 6-times faster than the iPhone — up from 4x at her mid-year talk. And, yet in spite of all this, Meeker concludes that smartphone growth still has an enormous upside, thanks in part to the fact that 29 percent of adults in the U.S. own some kind of tablet, up from 2 percent three years ago. 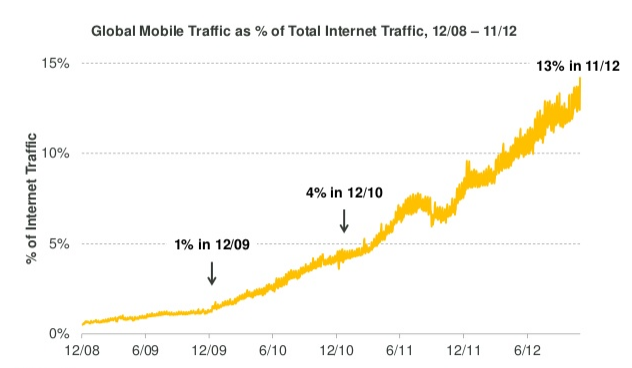 Mobile growth, again, continues to be the story. And that’s where we see the first big change from Meeker’s mid-year report. Mobile traffic has grown to 13 percent of Web traffic (up from 10 percent in her mid-year report) and, just in case you’re still looking for a Christmas present, Meeker qualified this by sharing the fact that 43 percent of kids want an iPad and 36 percent want an iPad Mini. That’s for ages 6 to 12, meaning that the demand for tablets among young people continues to ramp and ramp fast. 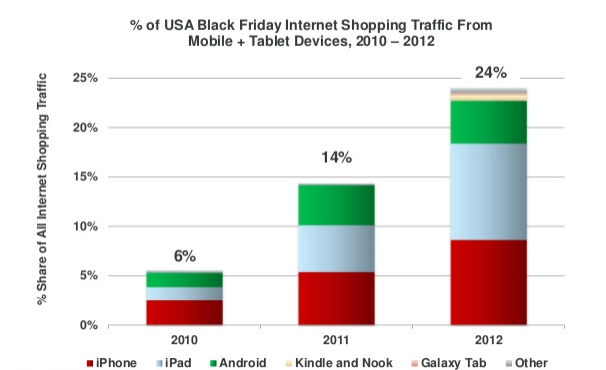 These are the two biggest changes, along with the fact that mobile phones and tablets represented 24 percent of online shopping on Black Friday, versus 6 percent two years ago, with iOS four-times that of Android on the year’s biggest shopping day. As a result, mobile monetization and revenue are growing at 129 percent CAGR and mobile and tablet, with both Meeker still seeing a huge up-side in the U.S. for both web and mobile advertising — to the tune of $20 billion. The growth of mobile has led to the diminishing market share of Windows, which is now at 35 percent, compared to the 45 percent share of Android and iOS. And while global smartphone and tablet shipments surpassed PC shipments back in 2010, Meeker expects the smartphone and tablet install base to hit its inflection point in the second quarter of 2013, surpassing PCs. The presentation then launches into the roster of industries and segments that the Internet and mobile devices are currently in the process of re-imagining. Most of these we’ve seen before in the mid-year report, including for Meeker’s “white space” — or that which is still left to re-imagine. But there are a few notable additions including the “Back pocket,” or credit card debt, education and health care. All in all, much of these “white spaces” focus on the elimination of an enormous problem Meeker identifies several times throughout the presentation: Debt. And one slide towards the end of the presentation puts a particular focus on student debt, which has now passed consumer auto loans and credit card debt in size. Which is sad and pathetic, but that’s me editorializing (not the KPCB partner).